The Seguin-Bacquey family have owned this nine-hectare Moulis property for over 150 years. The vineyard is planted with 60% Cabernet Sauvignon, 35% Merlot and 5% Petit Verdot. .
From Moulis, the smallest of the Medoc communes located on the Atlantic side of the Medoc. This hilly landscape is characterized by a diversity of soils’ gravel, limestone and clay. 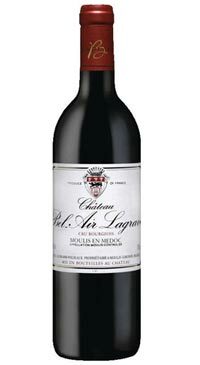 Chateau Bel Air Lagrave spends 18-20 months in oak, between 35% and 50% of which is new. It offers a seductive and well developed bouquet and harmony on the palate. This wine is a testament to the longevity of wines from this region and to how delicious a mature Bordeaux can be. The 1990 vintage is considered one of the best Bordeaux vintages of the century!